It is easy to think of achievements as something apart from the game proper. After all they are usually not referenced in game but rather in the game client, be that Steam, PS4, XBox One, and so on. 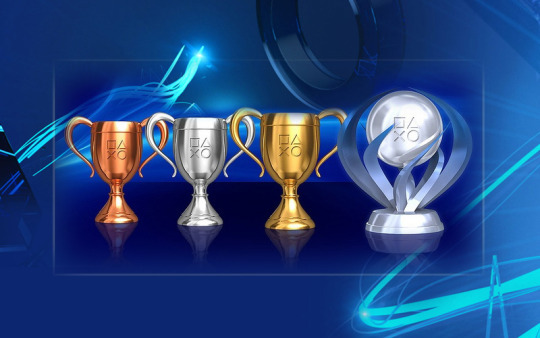 Regardless of where the achievement are stored/presented though achievements are a part of the experience of a game. Shouldn't those icons be in a diamond formation? This has always bothered me. That experience is an overwhelmingly positive one too. Achievements can be a reward, a pat on the back for beating a game. They can be aspirational and encourage you to push yourself further then you thought you could and really dig into a game. Achievements can even be used as an advanced tutorial by showing a player some interesting combination or interaction between abilities. They can be all these things and more. The one thing that achievements are that is a problem though is permission. It is good that achievements can be used to incentivise the player to do things, but we don't necessarily want to incentivise them to do things. 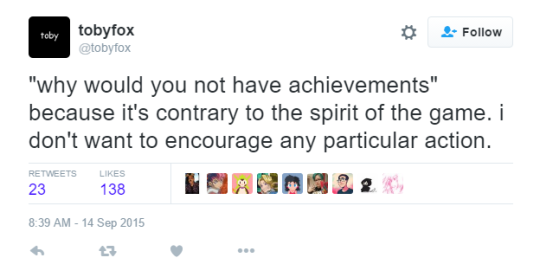 This is a thing Toby Fox was acutely aware of when he made Undertale and chose to not include achievements. This is basically the whole point of this essay in under 140 characters. When a game presents an option, left or right, the point of that choice is supposed to be to create a narrative specifically for the player. To let them be a part of the story. But by incentivising the player to pick both left and right by creating an achievement for having gone both left and right the game is removing the player from the story. 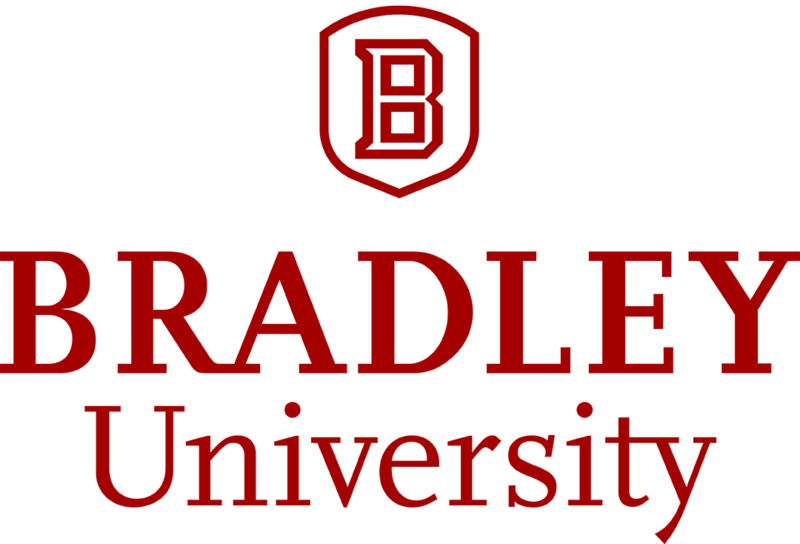 It stops being about what the player chooses to do and becomes a situation where the player is simply exploring the possibility space. Left or right? Both, and neither. It doesn't really matter. 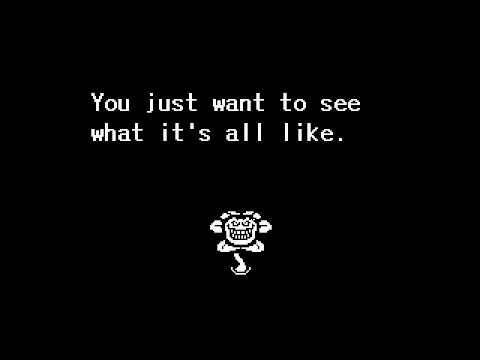 Undertale doesn't want the player to try out every ending or see every possibility. It doesn't want you to do everything just to see what is possible, Undertale simply wants the player to earnestly engage with it. It isn't subtle in its condemnation of the completionist mindset. There is an ending that specifically cuts off your ability to see other endings on other playthroughs. It has characters that call you out on restarting. It has many small mechanics and bits of dialog that encourage the player to not start over, not undo everything. That is an unusual thing to do in a game and that is part of what makes this game so resonant. Even though things in it are outlandish and ridiculous the things that happen feel like they stick because you don't want to start over and undo everything. Achievements aren't just encouragement, they are permission. They are telling the player that if they want to fully experience a game the way to do that isn't though earnestly and honestly interacting with it as yourself, but rather to ignore who you are and how you want to play the game, and just see everything the game has to offer. The choices in Undretale have extra power because you are asked to engage with them as yourself. Not as someone who is emotionally removed from the game, not as someone whose choices don't actually matter. If you do something in Undertale it is because you choose to do it. Achievements are permission to do terrible things in games. They make doing those things a requirement for "completeness". By requiring an action for "completeness" it makes the action the game's fault not the player’s. Spec Ops: The Line liked to use this against the player. It would use the normal mechanics of a game to get the player to unthinkingly do things and then turn it around and show them what they just did. The achievement "Kill 350 enemies with any rifle. (campaign only)" would be perfectly normal in most games, and by including it Spec Ops is encouraging you to go after it. Once you get it though the game doesn't treat it like a badge of pride, it treats it like a badge of shame. You did this, you killed 350 people. For a badge. No, you can't take it off. "You did this," Spec Ops says. "You told me to," you respond. "Yes" retorts Spec Ops, "and you did it." Spec Ops wanted to remind you that those power fantasies you engage in for fun have you miming atrocities. It used the language of games against the player to get them to do something ugly in an attempt to get them to rethink all of their other game experiences. Undertale didn't want that though. It didn't want to trick the player into doing something they would later regret. It wanted to present the player with choices. Not different paths the player would come back to and explore, but choices about who they wanted to be in this world and how they were going to treat it. By removing achievements it removes encouragements and so forces the player to confront the things they did on their own merits, not based on some arbitrary description of "complete". Achievements, be they for getting every ending or finding every doodad, encourage the player to explore choices not make them. It encourages a distance between the player and their choices. To be clear, this isn't me advocating the end of achievements. I love achievements. This is me saying that they are another game mechanic and so we must be careful in how they are used. Undertale is a bit of an exception here, it is a very earnest game in a way that most game don't want to me. But while we are looking at what it did to be so good it is also worth pointing out the things it didn't do too.